This article is about the county in Ohio. For other uses, see Athens (disambiguation). Athens County is a county in southeastern Ohio. As of the 2010 census, the population was 64,757. Its county seat is Athens. The county was formed in 1805 from Washington County. Because the original state university (Ohio University) was founded there in 1804, the town and the county were named for the ancient center of learning, Athens, Greece. Athens County comprises the Athens, OH Micropolitan Statistical Area. The county has a total area of 508 square miles (1,320 km2), of which 504 square miles (1,310 km2) is land and 4.8 square miles (12 km2) (1.0%) is water. Athens County is located in the Unglaciated Allegheny Plateau region of Ohio. It features steep, rugged hills, with typical relief of 150 to 400 feet, deeply dissected by stream valleys, many of them remnant from the ancient Teays River drainage system. Most of Athens County is within the Hocking River watershed, with smaller areas in the Shade River and Raccoon Creek watersheds. The Hocking River joins the Ohio River at the unincorporated village of Hockingport in Athens County. As of the census of 2000, there were 62,223 people, 22,501 households, and 12,713 families residing in the county. The population density was 123 people per square mile (47/km²). There were 24,901 housing units at an average density of 49 per square mile (19/km²). The racial makeup of the county was 93.48% White, 2.39% Black or African American, 0.28% Native American, 1.90% Asian, 0.02% Pacific Islander, 0.36% from other races, and 1.56% from two or more races. 1.03% of the population were Hispanic or Latino of any race. 21.4% were of German, 13.9% American, 12.9% Irish, 11.1% English, and 5.6% Italian ancestry according to Census 2000. There were 22,501 households out of which 26.40% had children under the age of 18 living with them, 43.50% were married couples living together, 9.20% had a female householder with no husband present, and 43.50% were non-families. 28.30% of all households were made up of individuals and 8.30% had someone living alone who was 65 years of age or older. The average household size was 2.40 and the average family size was 2.92. In the county, the population was spread out with 18.30% under the age of 18, 30.70% from 18 to 24, 23.70% from 25 to 44, 18.00% from 45 to 64, and 9.30% who were 65 years of age or older. The median age was 26 years. For every 100 females there were 95.60 males. For every 100 females age 18 and over, there were 93.30 males. The median income for a household in the county was $27,322, and the median income for a family was $39,785. Males had a median income of $30,776 versus $23,905 for females. The per capita income for the county was $14,171. About 14.00% of families and 27.40% of the population were below the poverty line, including 21.20% of those under age 18 and 12.90% of those age 65 or over. As of the 2010 United States Census, there were 64,757 people, 23,578 households, and 12,453 families residing in the county. The population density was 128.6 inhabitants per square mile (49.7/km2). There were 26,385 housing units at an average density of 52.4 per square mile (20.2/km2). The racial makeup of the county was 91.8% white, 2.7% black or African American, 2.7% Asian, 0.3% American Indian, 0.4% from other races, and 2.1% from two or more races. Those of Hispanic or Latino origin made up 1.5% of the population. In terms of ancestry, 22.1% were German, 15.2% were American, 14.0% were Irish, 10.4% were English, and 5.5% were Italian. Of the 23,578 households, 24.3% had children under the age of 18 living with them, 39.3% were married couples living together, 9.2% had a female householder with no husband present, 47.2% were non-families, and 30.0% of all households were made up of individuals. The average household size was 2.35 and the average family size was 2.87. The median age was 26.3 years. The median income for a household in the county was $31,559 and the median income for a family was $48,170. Males had a median income of $38,135 versus $31,263 for females. The per capita income for the county was $16,642. About 16.6% of families and 30.3% of the population were below the poverty line, including 29.6% of those under age 18 and 9.2% of those age 65 or over. Like most counties dominated by state universities, Athens County is a Democratic stronghold. In the 2014 gubernatorial election, it was one of only two counties to vote for Democrat Ed FitzGerald over Republican John Kasich (along with Monroe County). The largest employer in Athens County is Ohio University. Other significant employers include Appalachian Behavioral Healthcare, Hocking College, Diagnostic Hybrids, O'Bleness Memorial Hospital, Rocky Brands, Stewart-MacDonald, Wayne National Forest, and a growing number of retail stores and restaurants. Local government, local school districts, and nonprofit organizations employ many county residents. Historically, the first large-scale industry was salt production. Coal mining and timber harvesting played major roles in Athens County's economy, as did the treatment and care of the mentally ill. The coal industry has declined dramatically from its peak years. Only Buckingham Coal is still mining in the county, in Trimble Township north of Glouster. Gravel and limestone are mined at several quarries in the county. 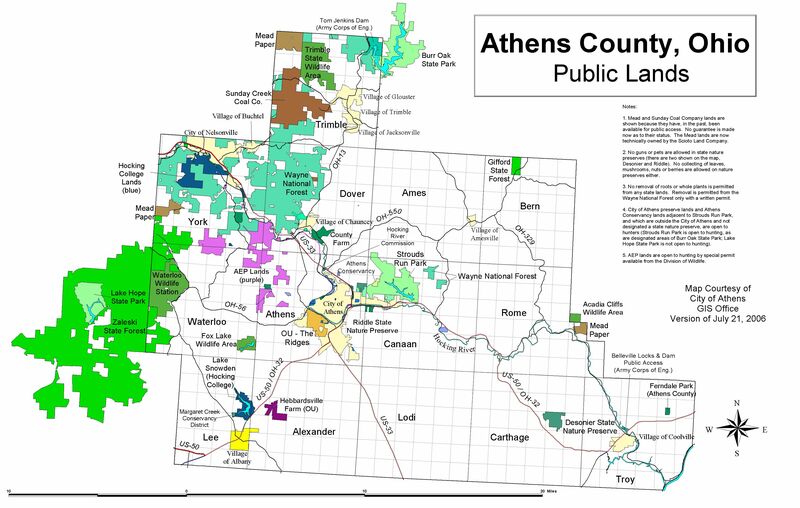 Active oil and natural gas wells are found in low numbers throughout Athens County. Forestry still contributes to the Athens County economy, both in the private sector and in the public sector. The headquarters for Wayne National Forest is located between Athens and Nelsonville. Farming and market gardening continue to thrive in the area. The largest farms specialize in beef and dairy production. The Athens Farmers Market, an outdoor market, continues to grow in popularity. Local and organically grown produce is found in abundance during the summer months. Also, tourism is a large and growing component of the county's economy. The county is a regional music center and home to many arts and crafts businesses. Many visitors to the county are drawn to its natural resources and abundant wildlife. Hunting and fishing are popular activities in season. The county has over 19 miles of paved bike path in and between Athens and Nelsonville. Hiking and mountain biking are popular throughout the county, especially in the state parks and national forest. Higher education remains the cornerstone of the county's economy. Over one-quarter of the county's residents either attend or work at Hocking College or Ohio University. Athens County is home to Hocking College in Nelsonville and Ohio University in the city of Athens. The residents of Athens County are served by the five school districts: the Alexander Local School District, Athens City School District, the Federal Hocking Local School District, Nelsonville-York City School District, and the Trimble Local School District. They are also served by the Athens County Public Libraries with branches in Albany, Athens, Chauncey, Coolville, Glouster, Nelsonville, and The Plains. The Athens Messenger, a daily paper published by the Adams Publishing Group, which also owns The Athens News. The Athens News, a free semiweekly tabloid. ^ The leading "other" candidate, Progressive Theodore Roosevelt, received 2,811 votes, while Socialist candidate Eugene Debs received 1,056 votes, Prohibition candidate Eugene Chafin received 106 votes, and Socialist Labor candidate Arthur Reimer received 27 votes. ^ "Ohio: Individual County Chronologies". Ohio Atlas of Historical County Boundaries. The Newberry Library. 2007. Retrieved February 12, 2015. ^ a b "State & County QuickFacts". United States Census Bureau. Retrieved February 7, 2015. ^ "2010 Census Gazetteer Files". United States Census Bureau. August 22, 2012. Archived from the original on May 4, 2014. Retrieved February 7, 2015. ^ "U.S. Decennial Census". United States Census Bureau. Archived from the original on May 12, 2015. Retrieved February 7, 2015. ^ "Historical Census Browser". University of Virginia Library. Retrieved February 7, 2015. ^ Forstall, Richard L., ed. (March 27, 1995). "Population of Counties by Decennial Census: 1900 to 1990". United States Census Bureau. Retrieved February 7, 2015. ^ "Census 2000 PHC-T-4. Ranking Tables for Counties: 1990 and 2000" (PDF). United States Census Bureau. April 2, 2001. Retrieved February 7, 2015. ^ a b c "DP-1 Profile of General Population and Housing Characteristics: 2010 Demographic Profile Data". United States Census Bureau. Retrieved December 27, 2015. ^ "Population, Housing Units, Area, and Density: 2010 - County". United States Census Bureau. Retrieved December 27, 2015. ^ "DP02 SELECTED SOCIAL CHARACTERISTICS IN THE UNITED STATES – 2006-2010 American Community Survey 5-Year Estimates". United States Census Bureau. Retrieved December 27, 2015. ^ "DP03 SELECTED ECONOMIC CHARACTERISTICS – 2006-2010 American Community Survey 5-Year Estimates". United States Census Bureau. Retrieved December 27, 2015. ^ "Clinton States her Case in Appalachia". Toledo Blade. May 3, 2016. Retrieved September 12, 2016. ^ Leip, David. "Dave Leip's Atlas of U.S. Presidential Elections". uselectionatlas.org. Retrieved 2018-05-01. This page was last edited on 19 April 2019, at 15:57 (UTC).